Nepal Prime Minister KP Oli’s India visit has removed many misgivings of the recent past. Oli returned as the PM this year with a sweeping mandate on an anti-India plank. When Indian Prime Minister Narendra Modi likened Nepal-India relations with the links between the Himalayas and the sagar, many thought he was offering an alternative to the Nehru doctrine. The doctrine, which regarded the Himalayas as India’s natural frontier in the north, was never received well in Nepal. Given Modi’s grooming in the RSS and his dislike for Nehru, it seemed that the Indian PM was putting forth a doctrine that stressed on the civilisational links between the two countries as the best guarantor of each other’s interests. But the phrase he used during his first visit to the Himalayan nation in July 2014 got buried in the deep distrust between the two nations in the following years. The curtness that dominated Nepal India relations after September 2015 — when a 134-day blockade by India caused a shortage of essential commodities, including petroleum products — turned into a blessing in disguise for the then PM K P Oli, making him turn to China. China too shed its past reluctance and agreed to take India’s place. In Delhi, Oli and Modi talked about connecting “Sagarmatha with the sea,” not as an alternative to Nehru’s security-driven approach but in a slightly different context. A 12-point joint communique, issued a day before Oli returned home— in contrast to both sides failing to issue one during Oli’s earlier visit in February 2016 — said India would be funding construction of a railway track between Raxaul in Bihar and Kathmandu. It would also explore possibilities of inland water ways connecting Kursela in Bihar to Chatara in Nepal. India also agreed to develop Nepal’s agri-sectors. Incidentally, these are sectors in which China has also shown interest. Whether India’s offer for rail connectivity will block China’s plan for a Lhasa-Kathmandu-Lumbini railway connection or force it to review this project, will be known when Oli visits China in the not-so -distant future. China has enhanced its presence, investment and interest in Nepal during the political transition in the country during the past 12 years. During this period, India has openly collaborated with the European Union and western countries in deciding Nepal’s political agenda. Modi is expected to pay a return visit to Nepal, soon after the elections in Karnataka, and make one final attempt at regaining the space New Delhi lost after the blockade. With Oli back and satisfied, he has reasons to be confident that the left-saffron barrier will not come in the way of India making its way back into Nepal’s good books. 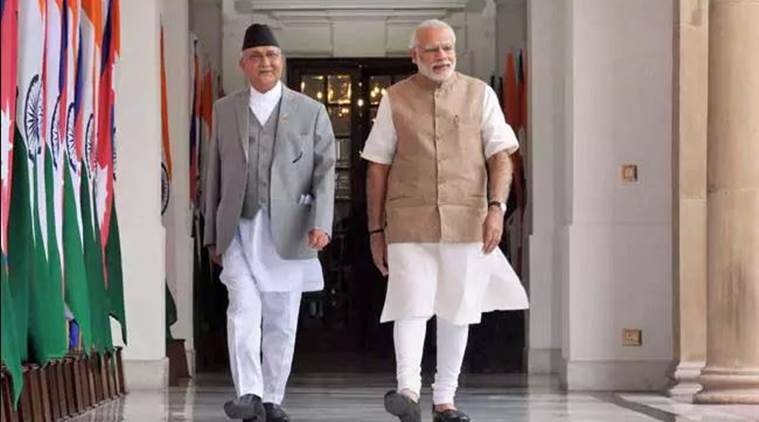 “Prime Minister Oli has been able to convince his Indian counterpart that relations between the two countries should be dictated by sovereign equality, mutual interest, respect for territorial integrity and principle of non-interference in each others internal matters,” a key member of Oli’s entourage said. But all this needs to be worked out beyond rhetoric. Nepal’s traditional political actors — Nepali Congress, Communist Party of Nepal (UML) , the Maoists and the Madhes centric leaders — have largely been interacting with India’s Ministry of External Affairs and the country’s intelligence units during the UPA regime. Their interaction with the BJP is more on an individual than on an institutional basis. The BJP, of late, seems to be trying to address this gap. Even before Oli formally took over as PM, the party seems to have sent an important leader to meet him. Minister of External Affairs Sushma Swaraj then visited Kathmandu to invite Oli to Delhi on behalf of Modi. Oli did not publicly raise the issue of the SAARC summit. This would have been seen with suspicion in New Delhi, especially after the Pakistani PM paid a brief but sudden visit to Kathmandu, ostensibly to congratulate Oli. There is at least one reason why China should be happy about the outcome of Oli’s visit, at least the way the Nepali PM has presented it. China has always advised Nepal to assert its sovereignty vis-a-vis India as well as have cordial ties. Oli, the man largely perceived as pro-China by India, seems to have done so.